The heart of the digital and social online world of today is driven by two big things. The first is people. The second is content. Think about it. What would Facebook, Instagram, LinkedIn, Twitter or even this blog be without content? What would it be without people to read it, share it and care about it? It would be nothing. Meaningless. Likely not in existence. If you want your content to resonate with the right people that will help you achieve your business goals, then you aren't going to do it by throwing boring content at the virtual walls and praying that the Facebook algorithm gremlins decide to show your content to the masses. Organic reach is dwindling to zero. Without content that inspires, connects with and helps your audience achieve their goals, it's all for nothing. Don't give up yet though. It's all a matter of creativity, focus and priorities. Did you know of the highest performing B2B content marketers, 90% say they prioritize their target audience's informational needs ahead of sales and promotional messages from their own companies. This is compared to only 56% of the least successful content marketers. According to a recent study by LinkedIn, 59% marketers create content for lead generation, 43% for thought leadership and 40% for brand awareness. Content is serious business. Smart marketers take it serious and invest time and resource into creating inspiring, relevant, empowering, interesting, memorable and impactful content. What are your objectives when it comes to creating content? Do you have a solid plan? Do you have a solid arsenal of content ideas that align to the needs of your audience and support your business goals? If not, you should if you want to succeed with content marketing in 2019. Do these questions and concerns sound familiar? 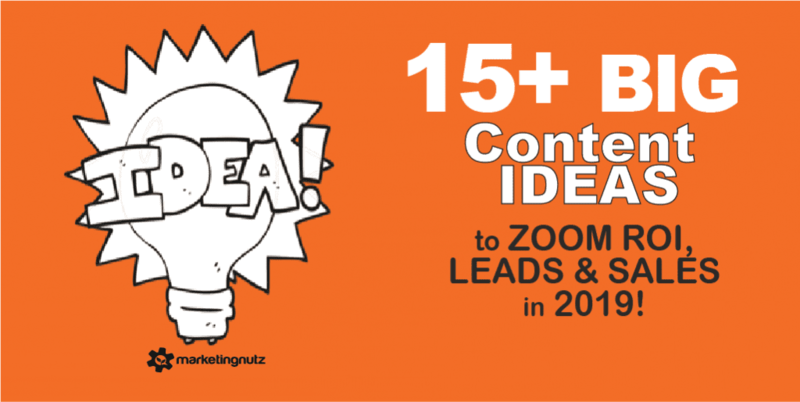 You feel that you are often at a loss for content marketing ideas? You feel confident in how to solve your customer's biggest problems, yet you are stuck with how to create and package up content that will demonstrate such? You feel like you create the same content over and over and would love to change it up. Not sure how to get unstuck from your content rut and tired of losing sales to competition who seems to never run out of inspiring content ideas? Need help with content ideas that don't take a month to create one blog post? Unclear if your content should be long, short or somewhere in between? Should you focus more on your competition or the needs of your audience? How often should you publish content related to industry trends and hot news? What are the best content ideas to help you establish authority and thought leadership? Should your content be more focused on your own business or the needs of your audience, dream customers and broader community? Is it alright to still use short quickly consumable pieces of content such as quotes, statistics and factoids? Should you recap live events and training or will the content expire too quickly? How do you leverage content from others properly and make certain you provide proper attribution and credit to original author? Take a listen to the 258th episode of Social Zoom Factor to learn 15 BIG Content Ideas to increase ROI and generate more leads and sales.